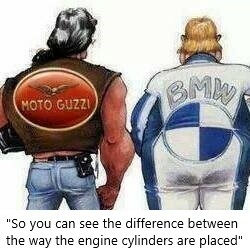 A variation on the "a BMW is a Guzzi with saggy t*ts"
He must have a LM1000, looking at his Popeye-sized right forearm, from holding those heavy throttle springs open. Either that, or he does a lot of w*nking! Winking? But that would affect his eyes. Nah, I reckon he owns a LM1, that big fore arm results from continuously polishing it when he ought to be riding it. You still ride ze Moto Guttzi? 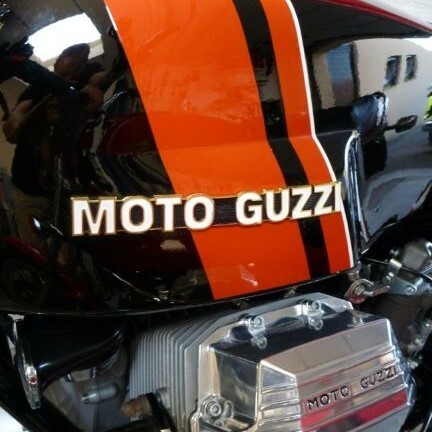 You like ze Moto Guttzi? You don't like ze sh*te BMW? The polite reply to that could be: "I thought the Italian economy needed propping up more than the German one" That should appeal to the German sense of superiority as well. Just a thought. Tongue in cheek... or someone you know? People I have known personally in Germany are all really nice, helpful, with a healthy sense of humour. OK, confess I don't know any Prussians.... Not like some unappealing Englishmen I get to deal with.